Program Title: STEAM Storytime: Outer Space! Half-storytime, half-lab in which we explore outer space. -Form air-dry gray clay into lumpy “moon rocks” and use a pencil eraser to dot the surface. Give yourself several days to let these dry out. Use this eHow article to guide you in making great-looking moon rocks. Our volunteers used balls of newspaper to form the clay around instead of tennis balls, and it worked great (and was much cheaper!). Of course, they were very fragile and most ended up being broken and crushed. Oh well! -Unless you’re lucky enough to own or find a sheet that looks like the surface of the moon, you’ll have to make your own. We found a large piece of gray-and-white speckled fabric, and then had an artistically inclined volunteer paint craters onto it. 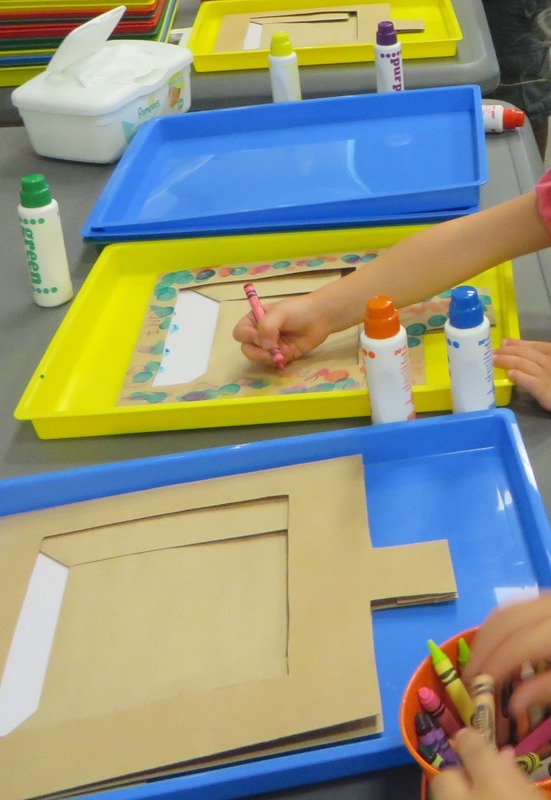 -Cut rectangular holes in one side of a paper bag (make one per participant). These will be “space helmets” that they can decorate and wear on a visit to “the moon.” Our inspiration for all of the three aforementioned pieces came from this one photo from the Oakland Public Library. -Make two small tubs (or one large tub) of Moon Sand (double this recipe). Cover tightly until you’re ready to use. -Cut out a bunch of squares, triangles, and long triangles for the spaceship name craft. 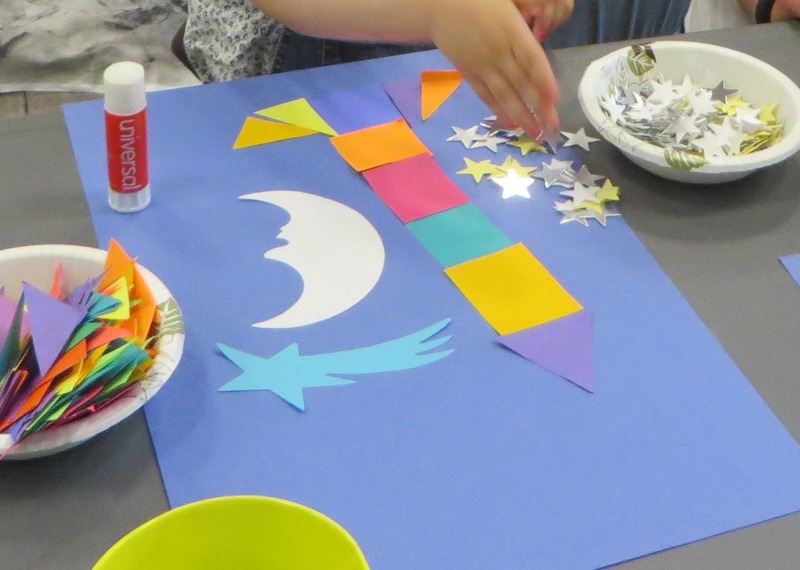 -Optionally, use a die-cut machine to make decorative stars and moons for the spaceship name craft. -Make a model of the spaceship name craft for the table. 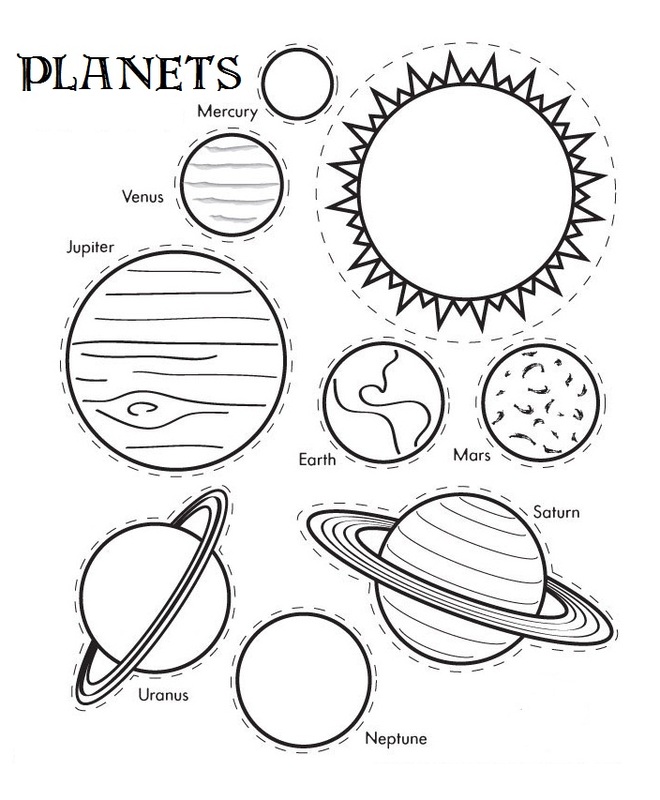 -Print out planet templates and cut out all 8 planets for each participant and separate into bowls, baggies, or piles. -If you don’t have some already, make flannels for the 8 planets and the Sun. We got inspiration from Miss Meg’s Storytime. 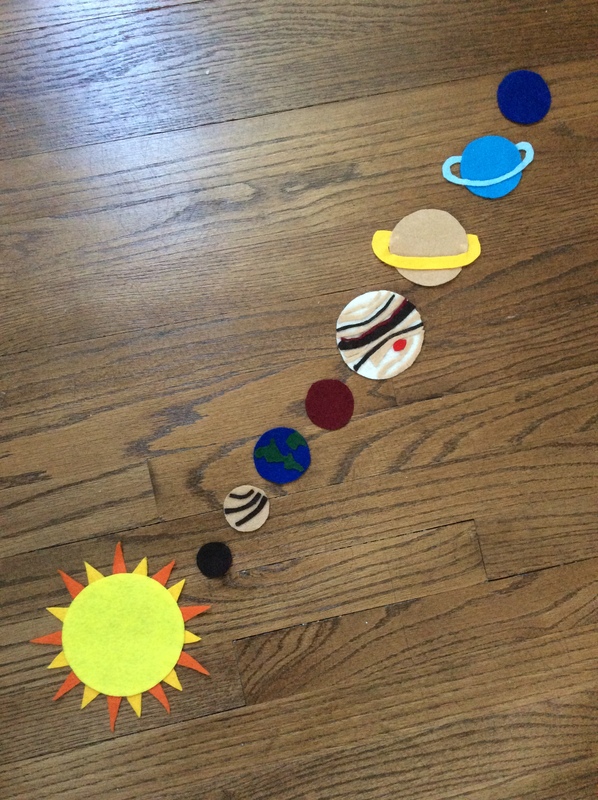 To make all the planets and sun different sizes, we found 8 circular objects around the kitchen, lined them up to make sure there was some sort of size progression, and then traced them onto flannel. -If you don’t have them already, make astronaut flannels. -To set up for the program, ball up sheets of newspaper on the floor. Cover them with the ‘moon surface’ sheet. Set the clay moon rocks in various places on the sheet. Put the tubs of moon sand in the middle of the sheet. Have wet wipes nearby for hands that will inevitably be greasy from touching the moon sand. 3. Brainstorm: Do you know what outer space is? What is outer space like? What is in outer space? That he called for another astronaut to come! That they called for everyone to come! Hot and bright, it gives us light. Round and ’round the earth it goes. The planets are out in space. Twinkly bright, they shine at night. The planets revolve around the sun, hooray, hooray. And spin on their axis, every one. Mercury, Venus, Earth, and Mars, hooray, hooray. All whirling and twirling among the stars. Jupiter and Saturn are next in line, hooray, hooray. We found this adorable craft on Miss Meg’s Storytime page. This is a very simple craft for the kids and parents to do together if you’ve done all the cutting up of shapes in advance. Just put out the model you made and let ’em go! Instead of just putting out this coloring sheet of the planets, we cut out enough of the planets for each participant and separated them into bowls. 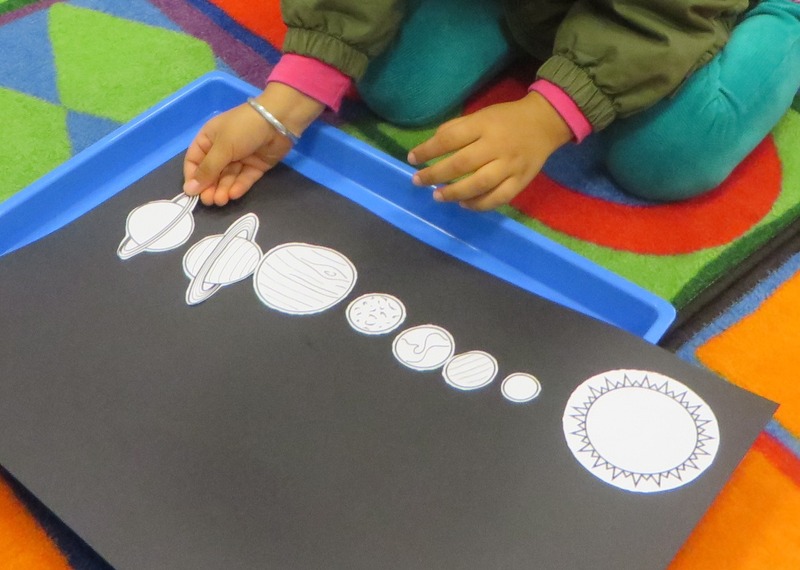 On a piece of black construction paper, we glued the planets on in order, on a diagonal. We instructed them to color the planets, as well. Again, if you make a model of this, it’s very easy for them to follow. Again, all inspiration for this station came from one lone picture from the Oakland Public Library. Truly, that one picture is so amazing that it made us want to do all the prep work it necessitated. At this station, kids decorated ‘space helmets’ first, put them on, and then had their parents use rubber bands to attach big foam sponges to the bottom of their shoes. Then, the kids were able to “walk on the surface of the moon,” touch “moon rocks” and “moon sand.” We didn’t have enough pairs of sponges for every child, but everyone had a chance to use them since there were other stations to rotate through. This was an absolute blast! Kids particularly loved the moon sand, and parents wanted the recipe for it. The moon rocks are cool, but easily broken by kids stepping on them. This means that you have sharp shards of clay sticking up all over the place that need to be taken off fairly quickly, lest anyone get hurt. They look really great, but it could be skipped–walking on the sponges with the helmet on and touching the moon sand seemed to be fun enough for them. OR, if you do want the added fun of moon rocks, we would suggest just putting them out separately on a table where they can be touched and held. Also, it was helpful to instruct the children and their parents in how to walk with big, exaggerated steps while wearing the sponges on their shoes. Once you showed them how to walk, it was very easy for them to “visit the moon”–without the demonstration, they tended to fall over! We would not recommend this for an even younger audience. We have done an outer space program for 1st-3rd graders, which is a good option to try for that age group. « Week Eighteen: Pi Day!